50% higher output than rigid metal pads! Most water panels are made of a rigid expanded aluminum grid that is dipped in a clay solution. 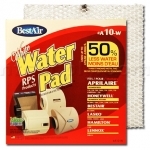 These pads are made of an expanded paper and as a result are able to hold more water than traditional pads. They have up to 50% higher moisture output than metal pads. Unlike metal pads, these should be changed twice during the humidification season.